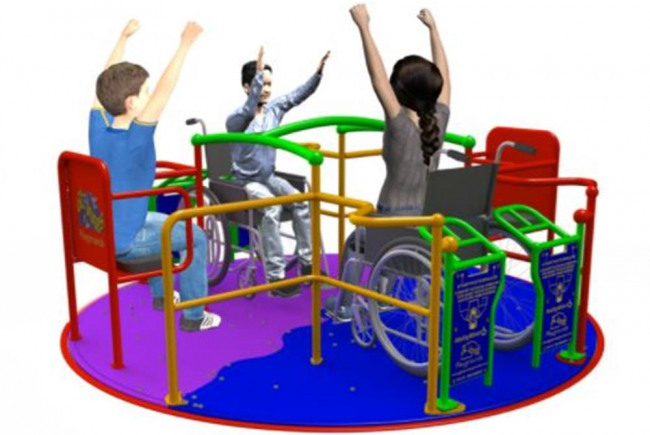 The purchase of a wheelchair roundabout for disabled children: to enable them to play and socially interact with other children. This project was funded on 23 Apr 2018! Our group has been trying to introduce more inclusive play equipment in the park for the less able children. The first, recently installed was an inclusive nest swing and was an instant hit with the disabled children. So much so, they were queuing up to use it. "This has been long overdue" one parent said. Once on the swing, the children stay on for some time knowing they'll have to queue again to get on it! 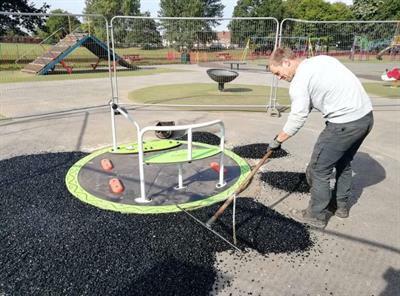 We now, in conjunction with Doncaster Metropolitan Borough Council, want to improve on the inclusive play facilities with a roundabout suitable for wheelchairs, there is no other play equipment like this in the vicinity. This would mean that children with physical and mental disabilities can use the swing with their brothers, sisters, friends or simply on their own! It would be the first of its kind in our park and would enhance the play experience for less able children. There is a definite lack of play facilities for disabled children in this park and the surrounding area. The provision of a nest swing was an instant hit, as will a wheelchair roundabout be. It will increase the Inclusive Play facilities in the locality. The roundabout was installed 28th August, and was open for business on 31st August. 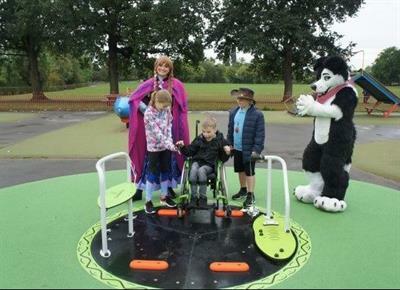 It was officially launched on 8th September by our Disability Champion 8yrs old Ethan, his sister Sophie, and Friends of Sandall Park Junior Ranger Archie. 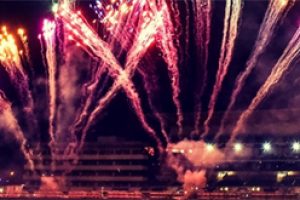 Our huge thanks to everyone who contributed to make this happen. Ethan, and many more disabled children will get years of pleasure from this facility - thanks to you all. 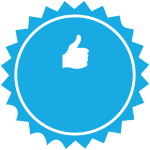 It is an amazing achievement. Sandra Crabtree, Chairman FoSP. The Friends of Sandall Park are a group of like-minded people who are dedicated to the improvement of the park for the benefit of its human visitors, birds, and resident wildlife. The group is primarily made up of volunteers (professionals; skilled workers - working and retired; local people) who work alongside professionals from various agencies, committed to regenerating the park. They are enthusiastic, forward thinking and will continue to develop the park in a way that reflects what the visitors want. They are the only voluntary group in Doncaster to have received the Queens Award for Voluntary Service (the MBE for voluntary groups). Project Delivery Manager: Friends of Sandall Park The Project Delivery Manager takes legal responsibility for receiving and spending the funds raised and ensuring the project is delivered.